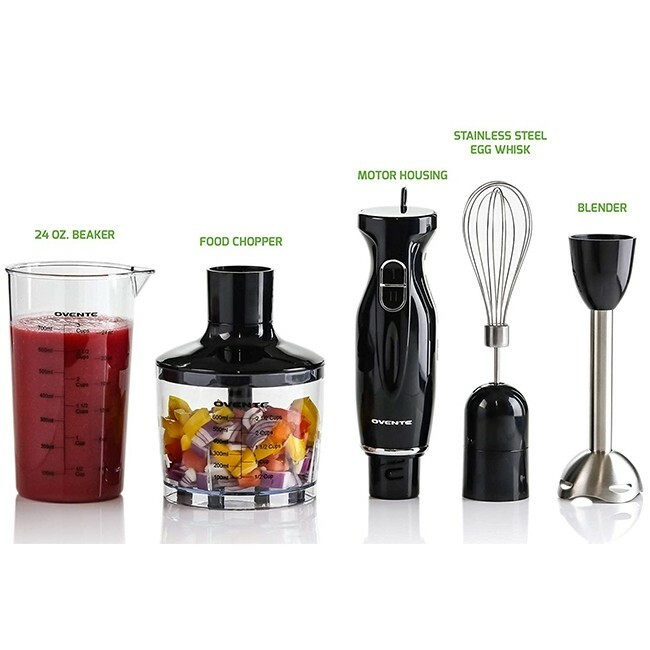 POWERFUL – Equipped with a high-speed 300-watt motor, it seamlessly blends ingredients together to make delicious and healthy smoothies, purees, creamy soups, marinades, sauces, juices, and much more. 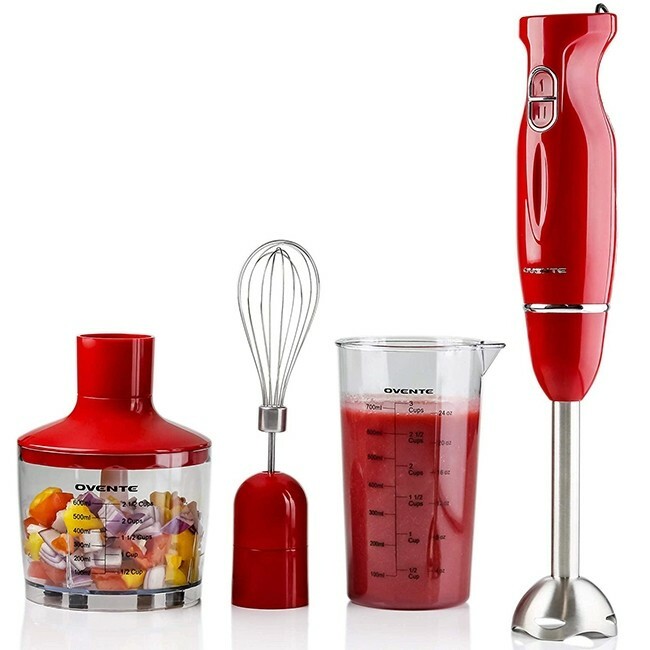 ADJUSTABLE SPEED – It comes equipped with a pulse-activated sensor with 2 blending speeds (low, high) to whip up your perfect texture and consistency with just one touch! 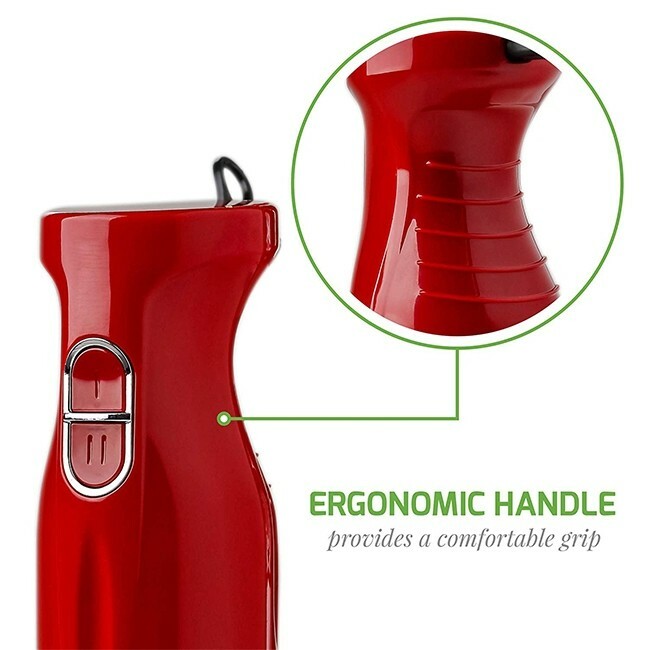 SLEEK & ERGONOMIC – Its motor housing body is sleek and ergonomically designed with a non-slip and easy-to-grip handle that feels sturdy and comfortable in your hand, so blending never feels like a chore. 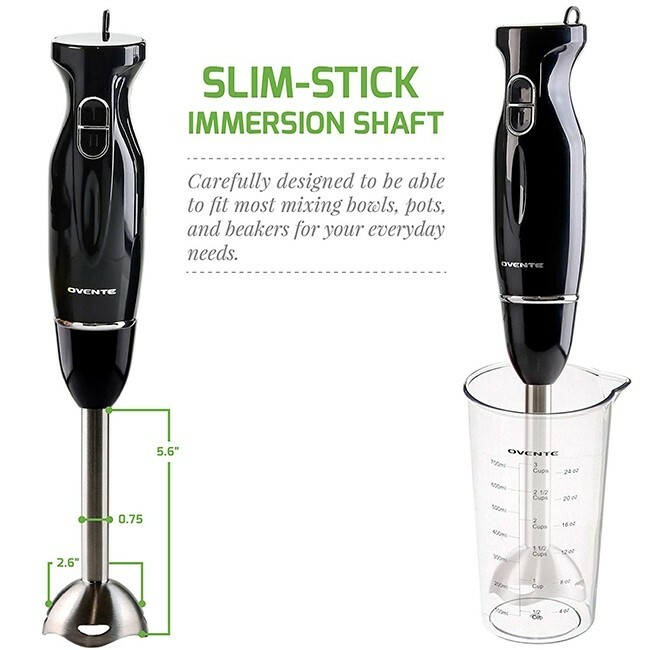 HEAVY-DUTY & COMPACT – Its slim-stick immersion shaft is made of 304-grade stainless steel, and was carefully designed to be able to fit most mixing bowls, pots, and beakers for your everyday needs. 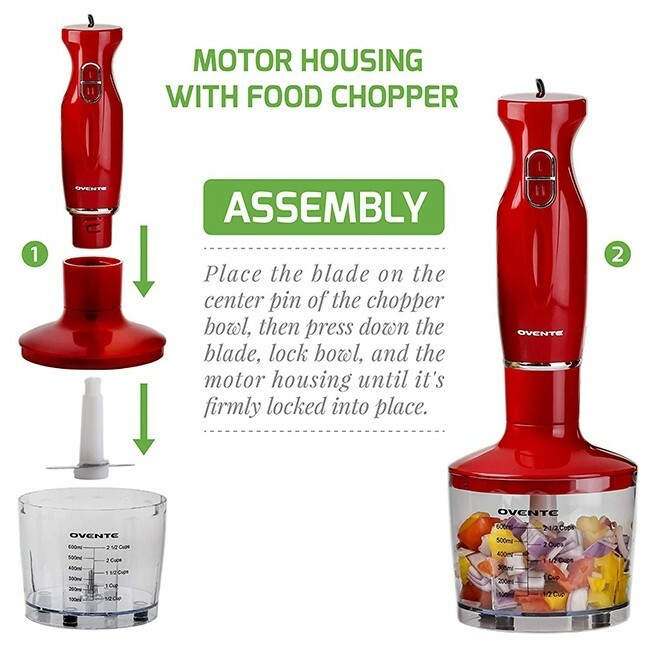 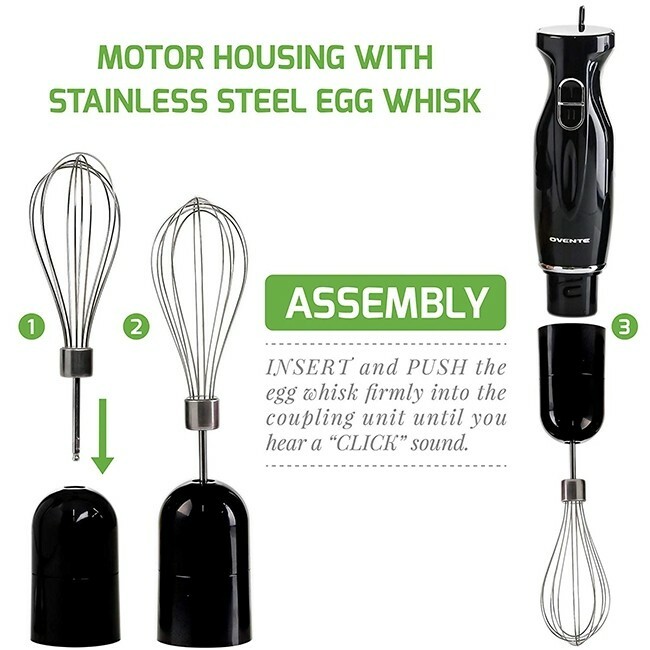 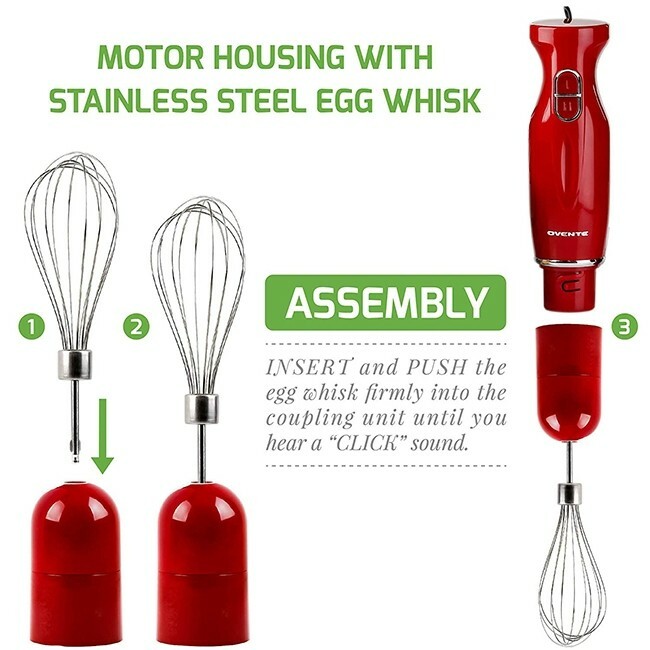 PACKED WITH ATTACHMENTS – Includes a food chopper that can be attached to the motor housing for chopping ingredients, a beaker that can be used for measuring liquid, and a stainless steel egg whisk for whisking cream, egg whites, and other treats. 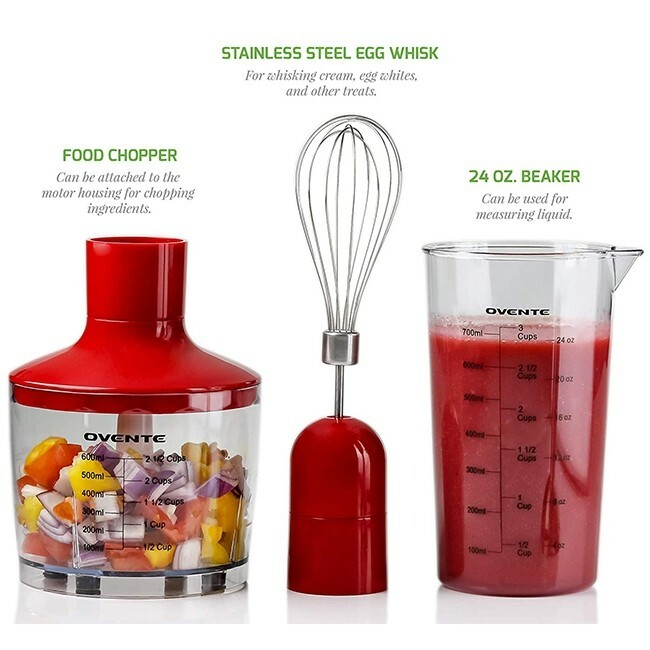 Discover a world of innovative cooking possibilities with the Ovente HS565 Multi-Purpose Immersion Blender. 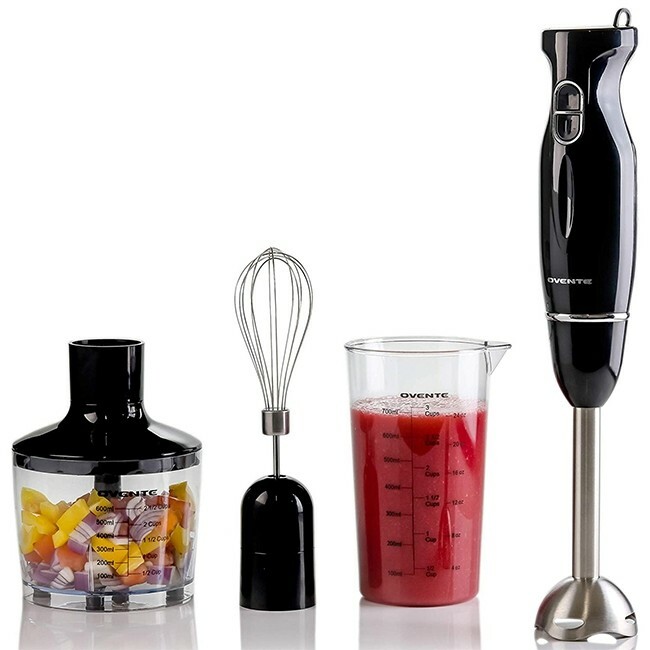 It’s a pleasure to blend and mix food with this hand blender because using this appliance is fun and effortless! 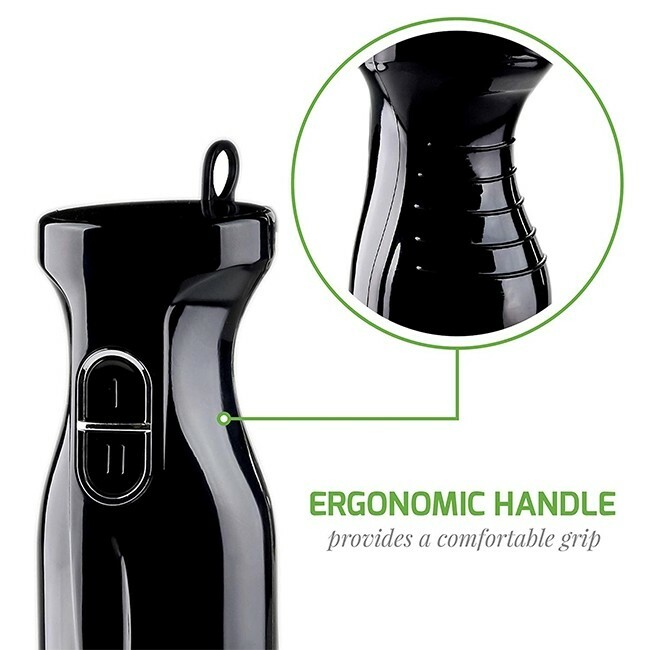 Its lightweight body along with its ergonomically-designed non-slip handle is comfortable to hold and control, that’s why cooking won’t ever feel like a chore again. 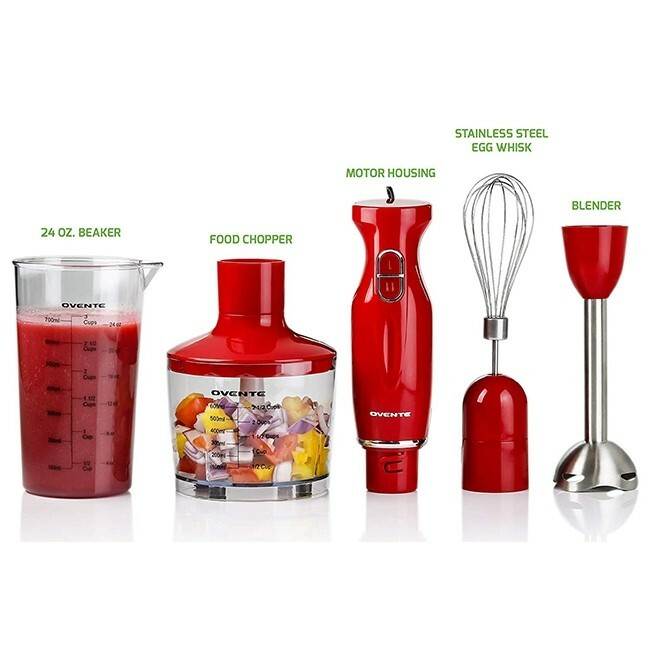 Whip up all of your favorite gourmet soups, guacamole, smoothies/shakes, cake batter, salsas, sauces, marinades, salad dressings, or even homemade baby food for your precious bundle of joy with just one press of a button. 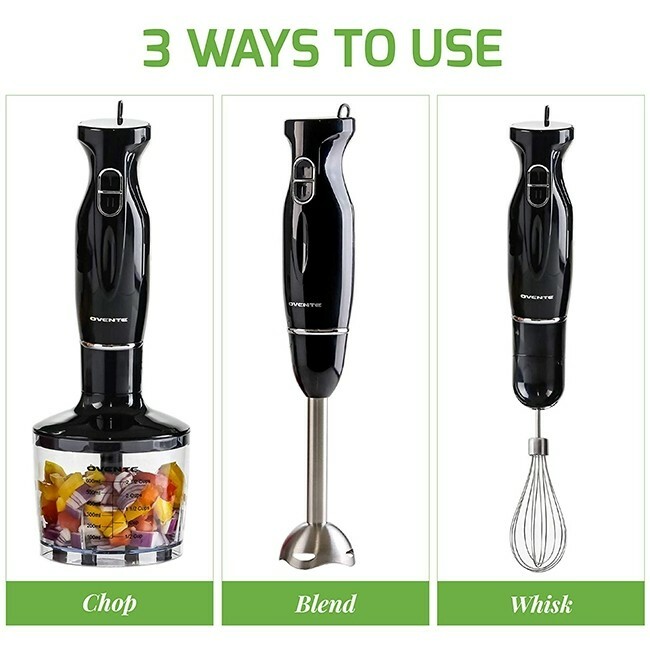 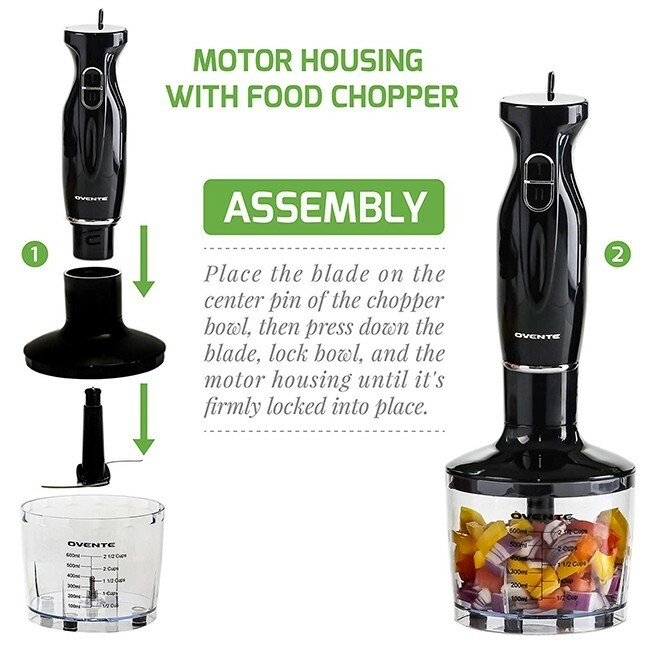 Powered by a powerful 300-watt motor, it works quickly and effectively — expertly mixing anything you desire into a smooth, evenly-mixed medley of mouth-watering flavors. 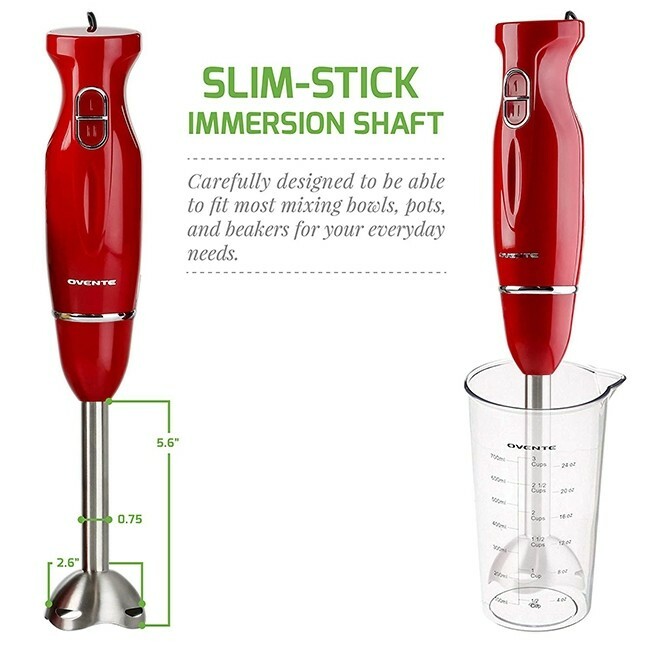 Its Slim-Stick design enables this hand blender to fit into any mixing bowl, pot, beaker, or cookware without restriction. 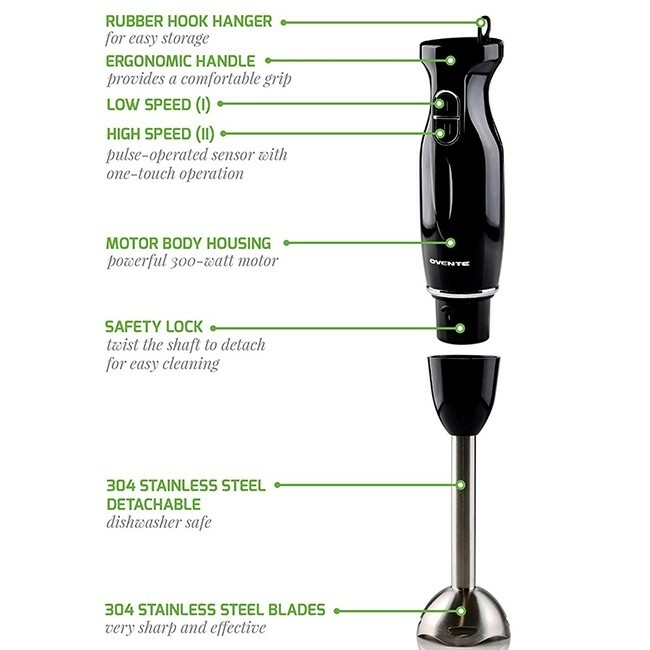 It’s compact enough to fit anywhere, but powerful enough for the toughest blending jobs. 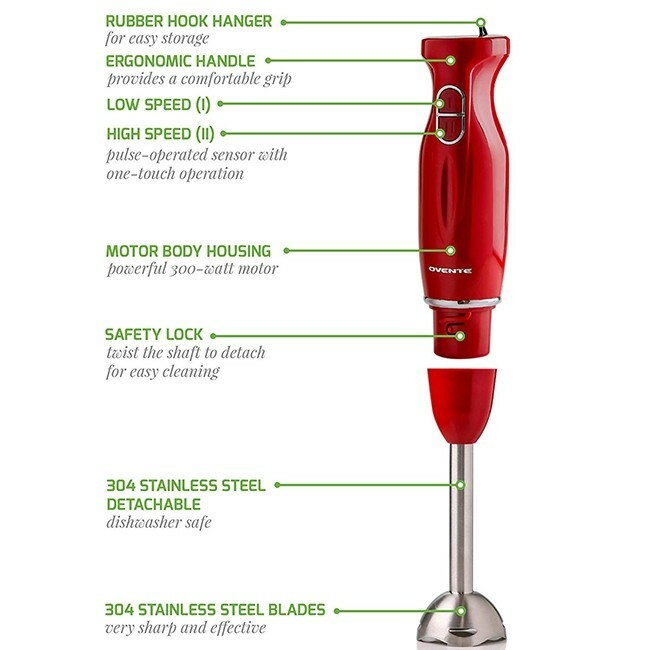 It was also carefully designed to come apart easily so that cleanup and storage are not a problem. 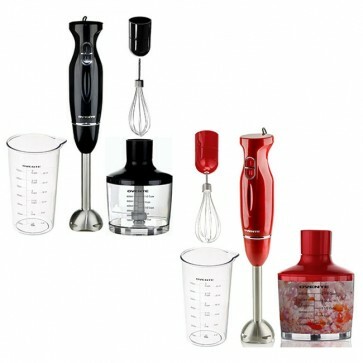 The hand blender also comes with 3 premium attachments – 24 oz. 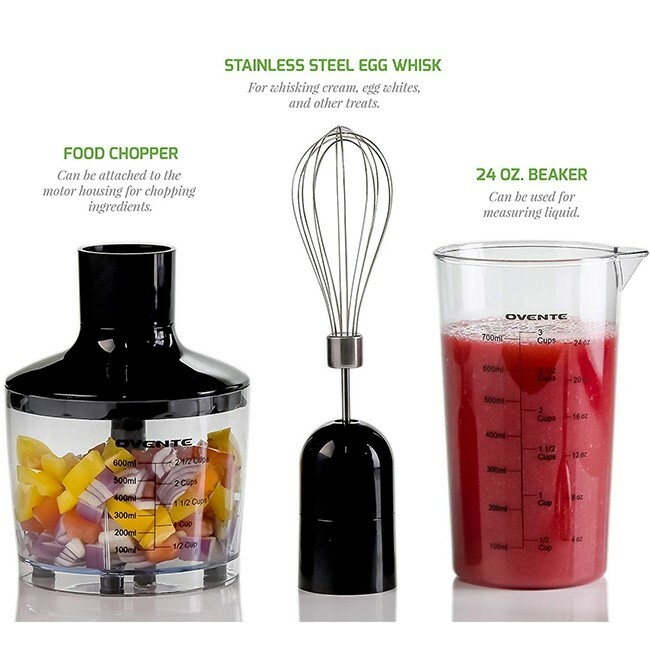 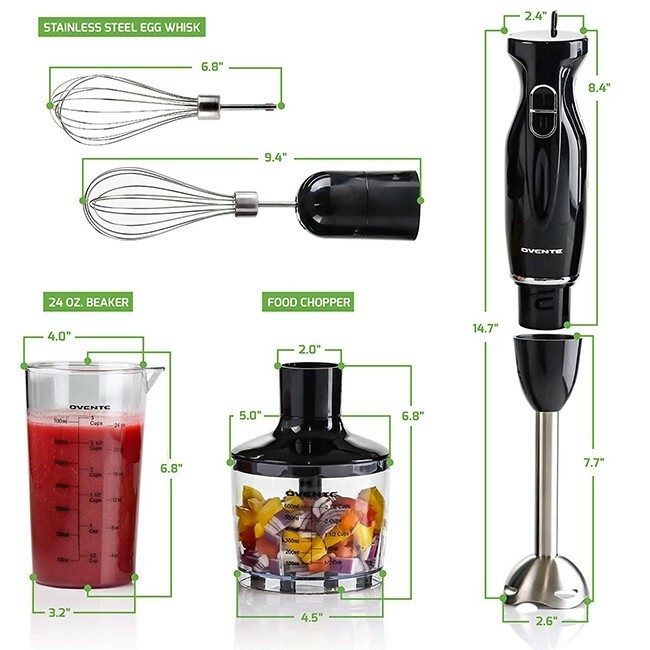 beaker that can be used for measuring liquid, a food chopper that can be attached to the motor housing for chopping ingredients, and a stainless steel egg whisk for whisking cream, egg whites, and other treats. 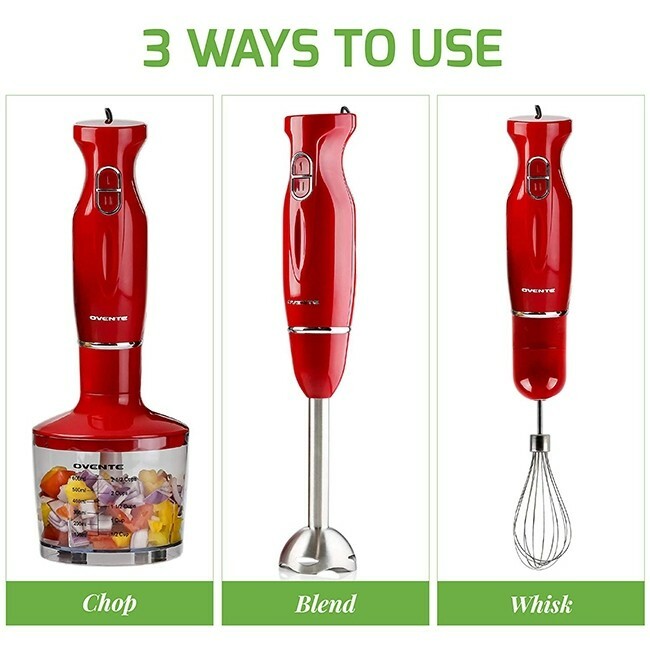 NOTE: TO PREVENT OVERHEATING, OPERATE THE HAND BLENDER IN ONE MINUTE INTERVALS OR LESS.